By announcing a leave of absence for "several days," Brian Williams started a ticking clock that will end with his return to the "NBC Nightly News" anchor chair. Unless he doesn't return. A growing number of people inside NBC believe he won't be able to return, but others are more optimistic. The television news world -- simultaneously close-knit and cutthroat -- is preoccupied by the story. I have never seen anything quite like it. Some are gleeful about what's going on, but many others are saddened by it. Many at NBC News are scared. Fundamentally the network now faces a wretched business calculation: Is Williams -- the No. 1 news anchor in the United States -- too damaged to continue in the job? And are NBC's ratings and profits better off with him or without him? To be clear, this is not what I'm asking. This is what NBC News officials are asking. In fact, they'd be derelict not to be asking. The president of NBC News is Deborah Turness. Her boss is Pat Fili-Krushel, the chair of the NBCUniversal News Group, which also includes MSNBC and CNBC. Fili-Krushel reports to NBCUniversal CEO Steve Burke. The trio of executives have said nothing publicly since Friday, when Turness confirmed that an internal fact-checking investigation was underway. But this crisis is taking up all of their time. Politico reported that Burke held a meeting at his home on Sunday about it. On Monday, the preliminary Nielsen ratings for last week's "Nightly News" came in, and they suggested further trouble. Williams had been beating his main competitor, ABC's David Muir, all week, including Thursday, the day after Williams apologized on-air. But on Friday, once the scandal had become a bigger national news story, Muir won by more than 300,000 viewers ages 25 to 54, the key demographic, and almost 500,000 total viewers. Such a dramatic day-to-day swing is highly unusual in network news. So will NBC executives make a decision about Williams' future "based on the entirety of his career and not only one or two or three mistakes," as MSNBC's Joe Scarborough put it on Monday? Or are the mistakes -- some are calling them lies -- and the resulting ratings trouble enough to end his career? Some say Williams has been telling tall tales for years, and it's finally caught up with him. They say NBC has to replace him right away, the sooner the better, to stem the proverbial bleeding. They think there's no way viewers will take him seriously anymore, not after #BrianWilliamsMisremembers became a trending topic. Is there some schadenfreude and television back-stabbing going on here? Sure there is. Pains at NBC could pretty quickly translate to gains at ABC and CBS, its two big rivals in network news. And as anyone in his position would, Williams has lots of detractors, just like he has lots of fans. But the scrutiny is legitimate. It's rooted in something real, not just in wishful thinking from NBC's competitors. 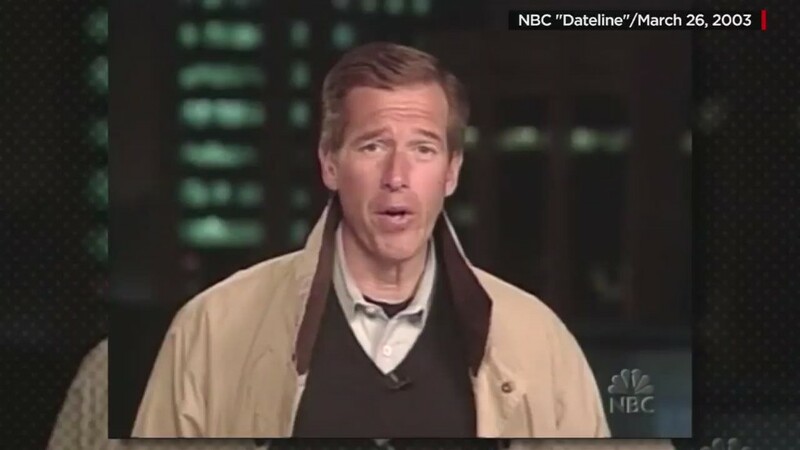 Maureen Dowd of The New York Times wrote on Sunday: "NBC executives were warned a year ago that Brian Williams was constantly inflating his biography." David Carr, also of The Times, wrote on Monday, "Those of us who worked the Hurricane Katrina coverage rolled our eyes at some of the stories Mr. Williams told of the mayhem there." While NBC conducts its own internal fact-checking exercise, journalists from many other news outlets are looking for other discrepancies in Williams' past reports. Some television critics have even started to call for Williams' resignation. "There is no way to contain the damage. No way to continue. No way out," Newsday's Verne Gay wrote, adding, "It's all over but the press release." One of my sources at NBC, who called Williams "too big to fail" on Thursday, took that back over the weekend and acknowledged it's now possible that he may be forced out. Others say Williams is in trouble, but NBC should stand by him and let him regain trust. These people -- including some at other networks -- are disturbed by the trial-by-Twitter that has enveloped Williams. They hope he can stage a comeback. "I feel sad about Brian Williams," former CNN host Larry King tweeted on Sunday night. Here's an important point: some TV anchors and executives are wondering what would happen if others' resumes and talk-show appearances were scrutinized the same way. There's lots of talk about second chances and the benefit of the doubt. MSNBC's Willie Geist said Monday that viewers "have every right if they don't want to watch him anymore, that's their right. But... I think we should look at the totality of the man" as well as the current controversy about misstatements. That sentiment can be found all over the "Nightly News" Facebook page, too. "Not watching until Brian is back," wrote one commenter. "Tuning out until NBC grows a spine and backs Brian," wrote another. Some of these fans say they're tired of "witch-hunts." So what's going to happen? No one knows. On my CNN program "Reliable Sources," I asked two veteran TV journalists -- Jeff Greenfield and Frank Sesno -- if Williams will return to the chair, and their answers were refreshingly blunt. "We don't know," Sesno said. "It depends where this investigation leads. It's just too much up in the air right now." Indeed, whether NBC has the stomach for all of this is an open question. The network has invested tens of millions of dollars in Williams. It just renewed his contract last December -- he's set to be the "Nightly News" anchor for almost the rest of the decade. Before this scandal, his newscast was No. 1 in the ratings among both total viewers and 25- to 54-year-olds (although not as firmly No. 1 as it's been in the past). But the current controversy now gets added to a long list of other challenges for the news division. Burke, the NBCUniversal CEO, must have cringed at this Politico headline on Friday: "The decline and fall of NBC News." Burke reports to Brian Roberts, the CEO of NBC's parent company Comcast (CCV). Roberts has a lot on his plate, including a pending merger with Time Warner Cable (TWC). I've known him to be the type of guy who hates distractions and controversies. He appreciates NBC News but he doesn't want it to embarrass him or his company. Right now, this is embarrassing.